The Unassuming Entrance At Reissue... Keep Your Eyes Peeled Or You Might Miss It! When you decide you're taking a trip, what's the first thing you do? Book your hotel? Check out flight times? Both are very logical and practical things but I handled my Japan trip a bit differently. From the emailed itineraries to the blog posts and articles, each was filled with more recommendations than I could possibly absorb. They all just kept coming in and I was especially grateful (since I was starting at ground zero), but I also began to feel a bit anxious. How was I ever going to fit in all of this incredible food and magnificent sites in a matter of 5 days? I found myself in quite the predicament, one that I welcomed, but still found overwhelming. Enough already. I closed my browsers, shut my laptop and took a breath. Thirty minutes and a glass of wine later, I picked up my phone and went to Instagram. #Tokyo #Tokyofoodie #Harajuku Each hashtag seemed to bring more remarkable photos than the last. Let's be honest, we eat with our eyes first. If something doesn't look appealing, the likelihood of trying it is slim. Thirty minutes and what felt like 3,000 photos later, I had compiled quite the compilation of food photos. I let these along with my standard foodie sources guide my culinary musings in Tokyo. As I was sucked into the abyss known as Instagram, I began to see the most intriguing latte art on repeat. You know I love a beautiful latte just about as much as I enjoy wine, which is saying A LOT. Immediately, this was moved from sort-of/maybe column to without a doubt, yes! Without further ado, I'd like to introduce you to Reissue Cafe. 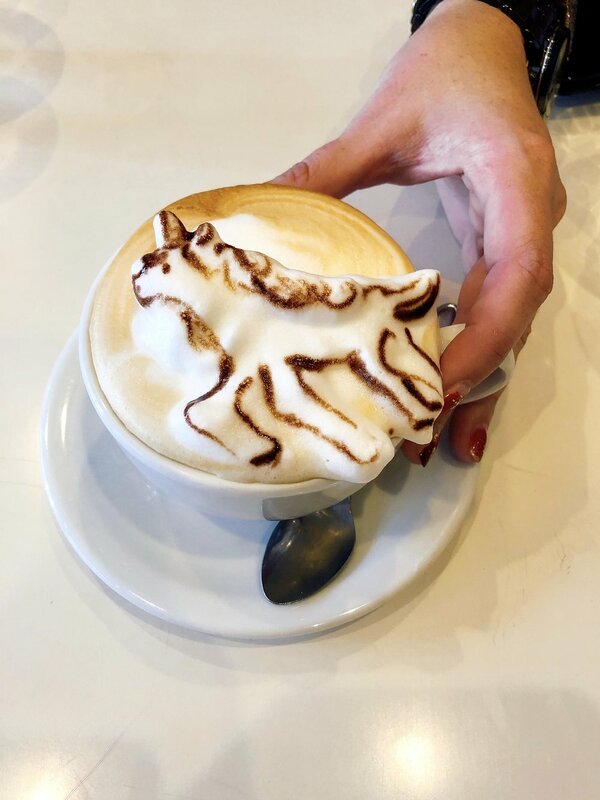 While there's no Instagram page to be found simply search #cafereissue or #3dlatteart and you will instantly find a portfolio that includes anything from basic 3D totoros to detailed portraits of your fur child or favorite human. Crazy, right? I was totally awestruck. To be honest, if I can get my milk to froth and it all makes it my cup instead of my kitchen counter, I call it a win. But to create latte portraits? That is next level. Period. At 9:50 a.m.(Reissue doesn't open until 10:00 a.m.), I was waiting with bated breath at the front door of Reissue Cafe. I know, obnoxiously early. Queues in Tokyo can take quite some time and I wanted to avoid that at all possible. Without fail, we wandered around the neighboring area and were the first ones in the door. Climbing the strangely steep steps, the aroma of coffee kissed my nose. I was more than ready to get caffeinated. Such Darling And Eclectic Decor...And Those Colors! Snapping a few obligatory decor shots, we surveyed our options. Of course, we chose the cozy green couch ensuring an ideal vantage point and let's face it, there's nothing more fun tha perusing someone's vinyl collection! Is anyone else intrigued finding a collection of this nature in Japan or is it just me? All Smiles Here! Can't Wait For My Latte Art! Huddled around the menu, we began discussing our coffee choices. I wanted them all and if I didn't have my best girls to rein me in, I'd like be sitting with seven or eight lattes in front of me. Cash Only: Fortunately, we had just pulled cash from the ATM at the airport the previous day and didn't encounter any problems, this could be unfortunate for those not prepared. Minimum Requirements: Reissue kindly requests that everyone in the group order a drink or food rather than squatting and sucking up wifi. Latte Art: Latte art can be 2D or 3D. Word of advice, give some thought to what you want before you arrive. I wanted SO many different things, that I ended up caving the last minute and being completely basic and ordering a cat. Latte art does take time and costs an additional ¥400. There were five in our group and only three ordered 3D latte art. After sipping our lattes, we were there almost an hour, so plan your schedule accordingly. How To Latteart- Worth Every Penny! Below are some of the fun designs our group enjoyed. Which is your favorite? Pretty Sure This Wins The Cutest Category! If you find yourself wandering the streets of Harajuku, pop over to Reissue Cafe for a treat. Tariff: Coffee starts at ¥420 yen, but of course you are going to want a latte for the art, right? Those start at ¥550 and the art is ¥400 extra. All in, you're looking at a $10.00 USD latte. WORTH EVERY PENNY. Drinking for the insta, after all. Potential Pass: Nothing! I really enjoyed this experience and my latte was super!